A Miami International Airport terminal was briefly evacuated early Monday after authorities found what appeared to be an explosive device but turned out to be harmless. What screeners thought was potentially deadly was nothing more than cremated human remains being transported between international flights, CBS station WFOR-TV reported. A watch was also spotted in the box that at first appeared to be part of an explosive device, said Transportation Security Administration spokesman Christopher White. The box was in an X-ray machine scanning checked luggage near a United Airlines ticket counter, he said. "It was a collection of items that, in total, raised our officers' suspicions to a level of contacting the Miami-Dade (County police) bomb squad," White said. 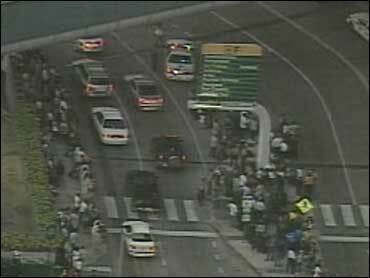 Hundreds of passengers milled around on the median outside Terminal F with their luggage from about 5:45 a.m. until police gave the all-clear around 7:30 a.m.
Carlos Maura of the Miami-Dade Police Department told WFOR-TV that it did not take long for the bomb squad to determine it was a false alarm. "Once the bomb squad came out, they were able to look at the package and find an identification name on the package and they contacted the family," Maura said. The terminal serves United Airlines domestic and international flights. The evacuation delayed six flights, affecting about 2,000 passengers, airport spokesman Marc Henderson said.